I take literally the statement in the Gospel of John that God loves the world. I believe that the world was created and approved by love, that it subsists, coheres, and endures by love, and that, insofar as it is redeemable, it can be redeemed only by love. I believe that divine love, incarnate and indwelling in the world, summons the world always toward wholeness, which ultimately is reconciliation and atonement with God. 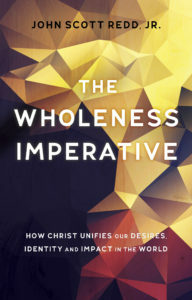 Christian Focus will publish my new book on biblical wholeness, entitled The Wholeness Imperative: How Christ Unifies our Desires, Identity and Impact in the World (Amazon link here). This book began with a couple of sermons and lectures that became a blog series before making it to a publisher. Following the thread of wholeness from Deut 6:4-9 that continues throughout the story of redemption, we can see how our faith in Jesus Christ changes everything in the human life, our loves, our hot takes, our sense of self, and our efforts to interact in the world around us. ~ John Scott Redd, Jr. There is a yearning within all of us to be ‘whole’ – a recognition that we live fragmented lives: striving and failing, believing but doubting, speaking one thing then doing another. We are all righteous sinners, in a battle with ourselves. Scott Redd uses certain specific texts from a cross-section of the Old and New Testament to examine this fight, discussing how we should be approaching it both theologically and practically in our day-to-day. With an engaging, humorous tone, The Wholeness Imperative presents Christ as the unifying force of our hearts and minds. The Wholeness Imperative is a delightful and encouraging read. Scott Redd invites us to walk with him as he reveals his own search for wholeness in Christ. He writes as a scholar with a pastor’s disposition. His humility, humor, honesty and hope lead us down paths that we should all be eager to follow. You will find yourself in this book time and again. You will find Christ and the wholeness He offers to you as well. Here is encouragement to become the story we tell. Through personal examples and biblical texts Dr. Scott Redd challenges us to find courage to live passionately for Christ, and to become the people God truly called us to be. Drawing from his extensive knowledge of Scripture, Scott Redd pursues the theme of wholeness through the story of salvation, from creation to the new heavens and new earth, in a way that is clear, faithful, and compelling. It will enrich both the pastor in the pulpit and the hymnwriter in the back pew. Scott Redd’s luminous style, personal anecdotes and literary allusions delight and engage us to keep on turning the pages to become whole. If you are looking for a good read, The Wholeness Imperative is it. In The Wholeness Imperative Dr Redd helpfully draws out – and illustrates from personal experience – the Bible’s teaching about the integration of faith and life. The book is a heart–warming call to an ongoing and holistic surrender to the Lordship of Christ. The author encourages a sanctification that brings every part of life into captivity to Christ in obedience. This book will help Christians to grow in grace and become what we are. Scott Redd gets behind the familiar truths that we recite and stirs us to think about what it means to love God with all our hearts. This book about holiness and wholeness aims at nothing less than healing the broken image of God.